What is a megathrust earthquake? 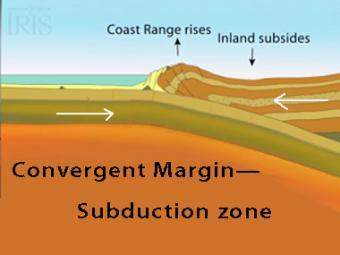 Subduction zone megathrust earthquakes, the most powerful earthquakes in the world, can produce tsunamis through a variety of structures that are missed by simple models. These include fault boundary rupture, deformation of overlying plate, splay faults and landslides. 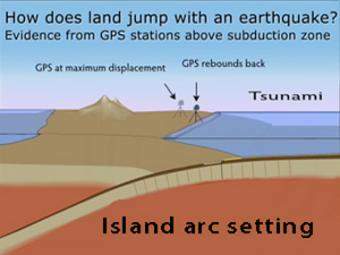 In this animation, we explore the three different tsunami-producing mechanisms by examining three famous earthquakes: Japan 2011, Chile 2010, and Alaska 2014. From a hazards viewpoint, it is critical to remember that tsunamis are multiple waves that often arrive on shore for many hours after the initial wave. The above mentioned quakes, as well as the catastrophic 2004 Sumatra subduction-zone megathrust earthquake, have delivered powerful lessons that rapid evacuation of tsunami inundation zones is a life-saving emergency response. 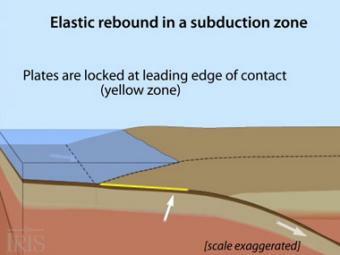 Oblique view of a highly generalized animation of a subduction zone where an oceanic plate is subducting beneath a continental plate. (See sketch below for parts.) This scenario can happen repeatedly on a 100-500 year cycle. 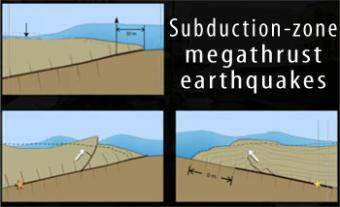 The process which produces a mega-thrust earthquake would generate a tsunami, not depicted here. Orphan Tsunami: Megathrust earthquakes in the Pacific N.W. Native American oral history, tsunami geology along the Pacific Northwest coastlines, dating of "Ghost Forests", and Sumurai records indicate that a Great magnitude 9 earthquake occurred off the coast of Oregon and Washington on January 26, 1700 at 9:00 pm. This was pre-European contact. GPS can record the movement of the leading edge of the overlying continental plate in a subduction zone. The plates are locked and the overlying plate is forced back. When friction is overcome and strain is released, the GPS receiver will snap back toward its original position. 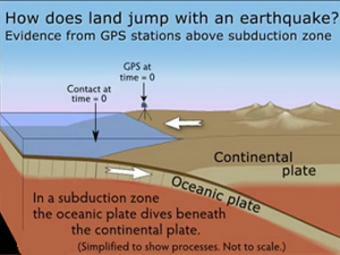 GPS records the movement of the leading edge of the overlying continental plate in a subduction zone. The plates are locked and the overlying plate is forced back. When friction is overcome and strain is released, the GPS receiver will snap back toward its original position.